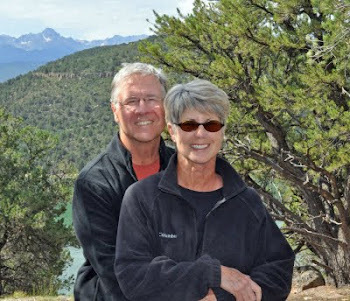 Find us on Google+ Rick and JoAnne's RV Travels: Let’s relax today…On our own! Rick and Hal decided to go for a short exploratory hike which apparently turned into a longer one for one of them. Rick made the decision to continue moving forward on the hike, Hal turned back about 5 miles into it. Hal asked for directions and was given the wrong ones by a passer-by. Lois and JoAnne went to the new Visitor Center, saw a movie, looked at the exhibits and all of a sudden I felt a pinch…it was Hal. He had made his way back to the service area, spotted the Jeep and thought we would be in that building. The three of us went to lunch. We drove back to our campsite and Rick was already back, Lois & Hal decided to get a new battery for their rig as the old one was completely dead and they had been running their generator for a couple of days. Rita and Jack took off for Mammoth, and reported back they saw a bear…ya…right!